It is a typical flag against the plague, similar to those that were made in the 15th century in Umbria, especially in Perugia, and which were used to invoke divine assistance in case of calamities and diseases. 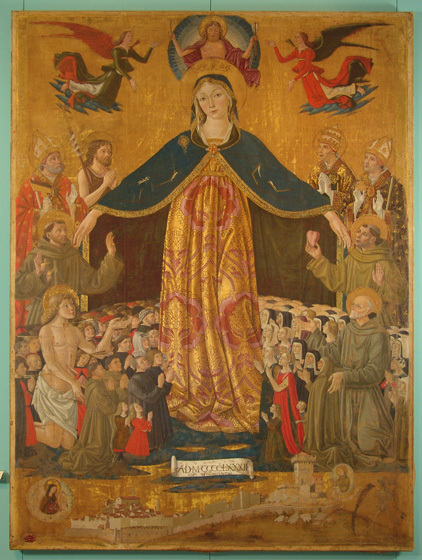 The Virgin of Mercy protects the believers with her cloak with arrows that symbolize the tragedies hurled from the judging Christ. The image of death, a skeleton with a sickle, alludes to the plague. In addition to St. Sebastian, St. Francis and St. Biagio on the left and St. Nicholas and St. Bernardino on the right, there are John the Baptist as patron of Montone, St. Gregorio, to whom the parish church was dedicated and Antonio from Padua, Franciscan miracle worker. At the bottom of the realistic representation of the city can be seen the Church of St. Francis and the fortress restored between 1422 and 1423 by Fioravante Fioravanti from Bologna and commissioned by Braccio Fortebracci. This fresco decorates the altar that Carlo Fortebracci built in 1476 as a votive offering for the birth of his son Bernardino, who ended the piece by calling Bartolomeo Caporali in 1491 to realize the fresco, as the inscription on the plaque below explains. As the Old Testament tells, the Archangel Raphael, who protected and helped the young Tobias on his journey from Nineveh to Media, is considered the protector of adolescents who leave home for the first time. During the Renaissance, on this occasion it was common habit to make propitiatory paintings in which Tobias had the look of the young man who left his home.